A two-vehicle accident at the intersection of state Route 235 and Christiansburg-Jackson Road on Monday resulted in two injuries, according to information from the Champaign County Sheriff’s Office. Pictured is a 2002 Chevrolet truck whose driver was cited for failure to yield. 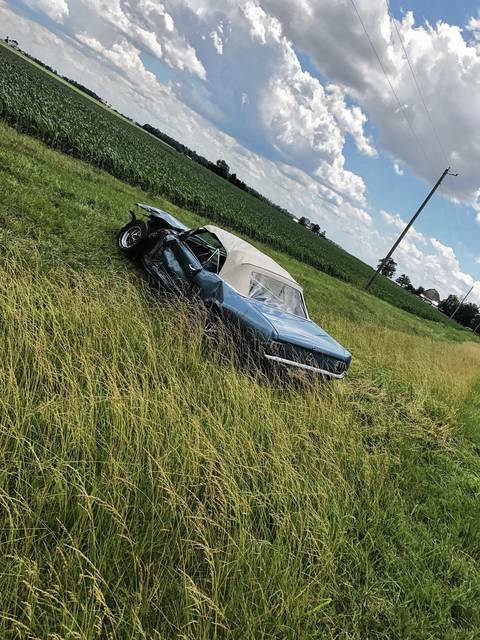 Two people traveling in this 1965 Mustang were transported by CareFlight to Miami Valley Hospital in Dayton after a Chevrolet truck failed to yield and collided with them on state Route 235 on Monday afternoon. 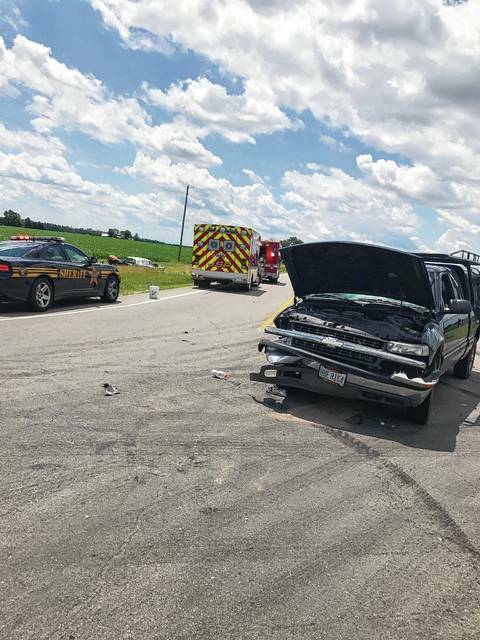 CHRISTIANSBURG – A two-vehicle crash at approximately 12:30 p.m. on Monday injured a driver and his passenger, according to a report from the Champaign County Sheriff’s Office. The accident occurred at the intersection of state Route 235 and Christiansburg-Jackson Road. Nathaniel Kane McConnaughey of 313 S. Edgewood Ave. in Urbana was cited for failure to yield. He was driving a 2002 Chevrolet truck. McConnaughey was not transported for injuries. The driver of a vintage 1965 Ford Mustang, Paul O. Fry of 13207 Licklider Road, Conover was injured in the collision. He was transported by CareFlight to Miami Valley Hospital, as was his passenger, Michael T. Bello of 108 Dublin Lane, St. Paris. Route 235 was closed to thru-traffic for a short time after the accident.